The Cherokee County Search And Rescue Team is available to do public relations talks for anyone in the community. We have several programs available from basic outdoor safety to the nationally recognized Hug-a-Tree and Survive program. We are available to do programs for scouting groups or even subdivision watch groups on lost children programs. Email us with your event information and someone from our team will be in contact. One of the public service activities that the Cherokee County Search And Rescue Team engages in is making presentations of the Hug-A-Tree and Survive program. The Hug-A-Tree and Survive Program was first conceived in the mountains near San Diego, California, after a search for a nine-year-old boy that ended in tragic death. A group of those that searched for him developed this program hoping that no child would ever need the information, but that the information would help them survive if the situation were to arise. Always carry a trash bag and whistle. Your family will not be angry with you. Animals are afraid of humans. You have hundreds of friends looking for you. The presenter discusses each of these points with the children. They are encouraged to ask questions and discuss feelings about the woods and how to deal with those feelings. Then the presenter shows a video about Johnny who gets separated from his family and uses the hug-a-tree principles to survive. They will also discuss the importance of a “survival kit” that can be easily made from household items. The items are displayed and discussed. The children get to keep the booklet and take it home to discuss with their families. The goal is to make children aware of what they can do to make it easier to be found if they become lost and how to get by until they are found by searchers. It is also meant to keep children from being afraid of the woods and give them some confidence tempered with the knowledge of how to remain safe. 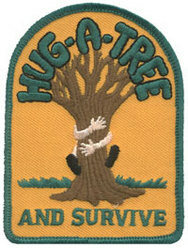 The team can be contacted to arrange for a presentation of Hug-A-Tree and Survive for your organization.